Our Vision: A community fully alive in Christ. Our Mission: At Saint Brigid of Kildare, nourished by The Word and Sacraments, we find life in Christ by gathering disciples for worship, service, and education. Saint Brigid Catholic School works to educate the whole child – mind, body and spirit – providing a well-rounded student experience. Saint Brigid Catholic School has a long and proud tradition of offering excellence in Catholic education and has sent nearly 1,500 graduates into the world since 1922. 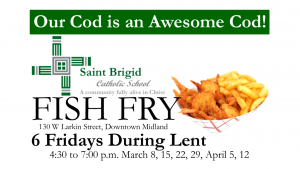 Only Saint Brigid offers a dynamic, faith-based environment with proven success. Students, parents and alumni believe in Saint Brigid Catholic School, because from kindergarten through eighth grade, we prepare students for success in learning and in life. Watch “A Day in the Life at Saint Brigid Catholic School” below!